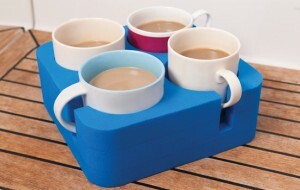 The Muggi makes it easy to serve beverages on board. In the latest installment of the Daily Boater's weekly Marine Product Review, Mark Sutton of MarineProductReviews.com serves up an innovative new product for the galley called "Muggi." 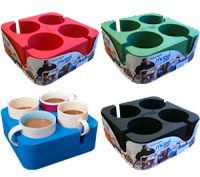 The Muggi is a lightweight foam cup and mug holder that is is elegant in its simplicity and is a product that could be valuable aboard just about any boat. We put the Muggi through its paces on a charter in the BVI. We figured that this would be a good testing ground as we typically like to have my morning coffee while underway and there are reliable northern swells. Several years ago on a previous BVI charter, we were hit by a series of swells that sent the coffee (and lots of other stuff) flying. Coffee spilled, a mug broke and there was plenty of cursing. Needless to say there was no Muggi! We found the Muggi to be a stable and skid resistant holder for coffee mugs on deck as well as a stable base for holding mugs while pouring. As for storage, the Muggi is also a nice holder for mugs while in the cabinet and it fits well in the galley sink - this helps to keep the dirty mugs from clanking about until you are able to wash them. 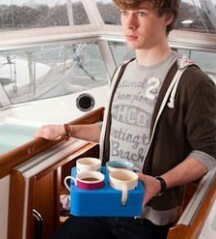 Last but not least, the Muggi serves as a handy carrying tray that lets you easily and safely take up to four drinks from the galley up to the cockpit, leaving you the other hand free to steady yourself. This is not only convenient but most importantly safe! The Muggi is also a very reasonably priced boat product and makes a great gift. You can find these on the Muggi website for around 15 GBP (a little over $23 USD). Find more reviews by Mark Sutton at his site, Marine Product Reviews.